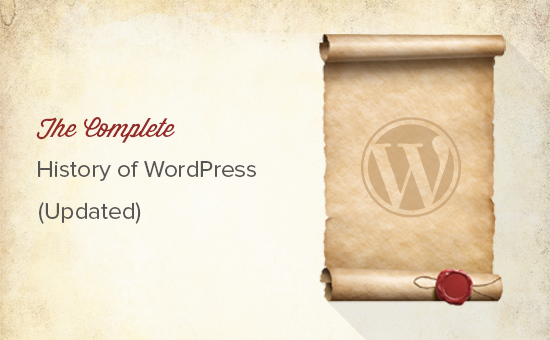 Do you want to know about the history of WordPress? If you are starting a WordPress blog or website today, then you see a popular website builder which powered more than 32% of all websites on the internet. In this article, we want to take a look back at the history of WordPress to show you how it evolved over time. The story of WordPress tells us how open source communities work to make something so useful without compromising software freedom. WordPress project is driven by a community of dedicated developers, users, and supporters (Related: Why is WordPress free?). WordPress started out because the development of an existing blogging software b2/cafelog was discontinued by their main developers. In 2003, two users of b2/cafelog, Matt Mullenweg and Mike Little, decided to build a new platform on top of b2/cafelog. They probably didn’t know that they are about to start a journey that would eventually benefit millions of users around the globe, create thousands of jobs, and a whole industry of developers, designers, writers, bloggers, and web publishers would make their living off it. In May 2004, version 1.2 of WordPress came with plugin architecture. This enabled users and developers to extend the functionality of WordPress by writing their own plugins and sharing them with rest of the community. As WordPress was opening itself to the community, something totally opposite was happening in the blogging industry at that time. The market leader in blogging tools industry at that time was Moveable Type. They announced new licensing terms which were not liked by many of their users. This forced many of their users to look for a new blogging platform. WordPress 1.2, presented itself as an ambitious project offering users a mature, stable, easy and flexible platform with features that rivaled their proprietary competitors. The adaption rate of WordPress skyrocketed with this release. With the increase in the number of users, WordPress started getting better with the help and interest of the community. 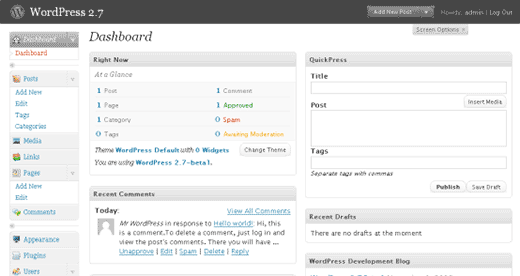 In December 2005, WordPress 2.0 was released with a new admin dashboard. This new admin area was a complete overhaul of the administration screens in WordPress. The shiny new admin UI was not the only significant improvement in this release. It was the first release that came with Akismet anti-spam plugin pre-installed. It also came with a WordPress database backup plugin, wp-db-backup, which was then dropped in 2007. Another first for this release was the introduction of a functions.php file in the Theme System. On March 1, 2006, Automattic, the company founded by WordPress co-founder Matt Mullenweg, filed the trademark registration for WordPress and WordPress logo. 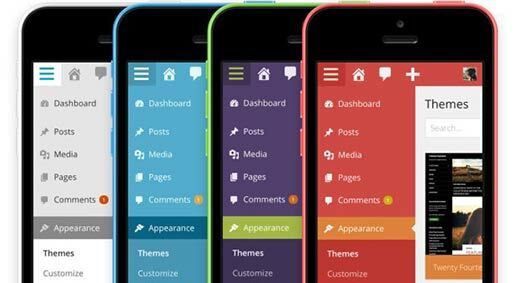 In 2008, a web design company called Happy Cog joined the WordPress project to help design a new WordPress admin interface. A usability study was conducted to design the admin UI. Throughout the year new features such as shortcodes, one-click updates, and built-in plugin installation were added to WordPress with different releases. In June of 2010, Automattic, the company founded by WordPress co-founder Matt Mullenweg, transferred the ownership of WordPress trademark and logo to the WordPress Foundation. This was a significant moment in WordPress history, because it ensured that WordPress will continue to grow, and is not dependent on a company or a group of developers to continue the project. On June 17, 2010, WordPress 3.0 was released. It was a major step towards WordPress as CMS. This release introduced several features such as custom post types, better custom taxonomies, custom backgrounds, header, menus, contextual help on admin screens, etc. WordPress MU project was merged into WordPress core to create Multisite networks. 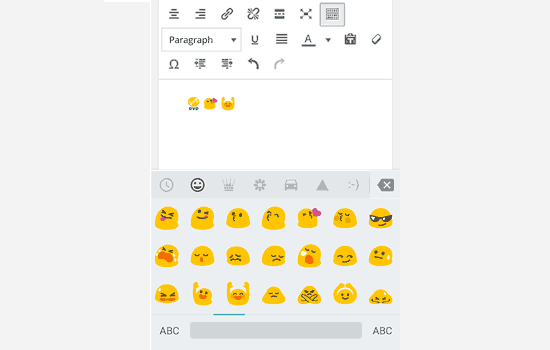 It also came with Twenty Ten, which started the tradition of a new default theme for each year. 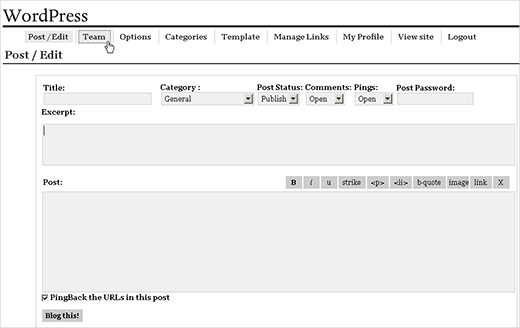 In 2011, Post formats and admin bar made their way into WordPress. Around that time, some really cool WordPress plugins were building powerful eCommerce platforms on top of WordPress. This enabled WordPress users to create online stores and build powerful ecommerce websites using WordPress. 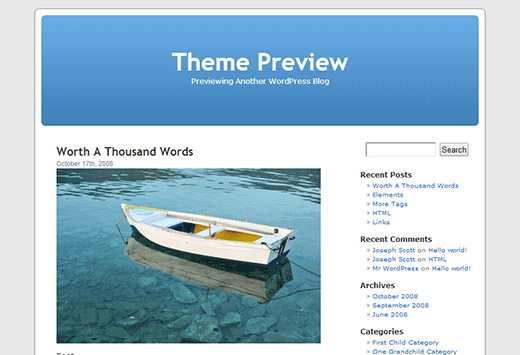 In 2012, theme customizer, theme previews, and new media manager were introduced. These features tremendously helped new users in creating image galleries and previewing themes before they change to a new theme. In 2013, WordPress 3.7 came with the new automatic updates feature that allowed WordPress to automatically update your site’s software for minor releases. The automatic updates feature is very similar to what Google Chrome browser does. Several users didn’t like the feature, so we wrote a tutorial on how to disable automatibecometes. By this time WordPress had already became the most popular CMS in the world. In December 2013, WordPress 3.8 was released which introduced MP6, the new WordPress admin interface. This new interface was responsive and was aimed to provide a better user experience to users, on any device or screen size. On April 16, 2014, WordPress 3.9 was released. 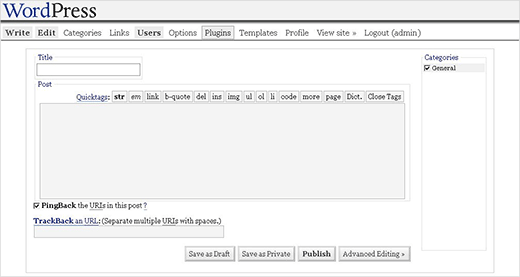 It focused on improving the WordPress visual post editor. Images can now be dragged and dropped directly into the post editor. Users are now able to edit images right inside the editor and see their gallery previews inside the editor. 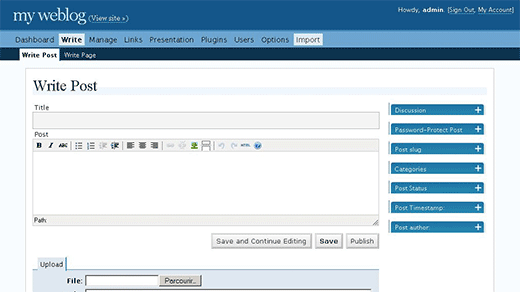 WordPress 3.9 also introduced live widget previews, audio playlists, and several other enhancements. More refinements were made to WordPress core throughout the year with subsequent WordPress 4.0 and WordPress 4.1 releases. 2014 was also the first year when non-English downloads for WordPress surpassed English downloads. In 2015, WordPress 4.2, 4.3, and 4.4 were released. These releases focused on improved localization, emoji support, theme customizer, and laying down infrastructure for the WordPress REST API. In the same year, WooCommerce, the most popular WordPress eCommerce plugin was acquired by Automattic (the company founded by WordPress co-founder Matt Mullenweg). In 2017, WordPress 4.8 and 4.9 were released. These releases brought several new default widgets to add audio, video, images, gallery, rich text, and HTML. These releases also laid the groundwork for the new WordPress block editor. 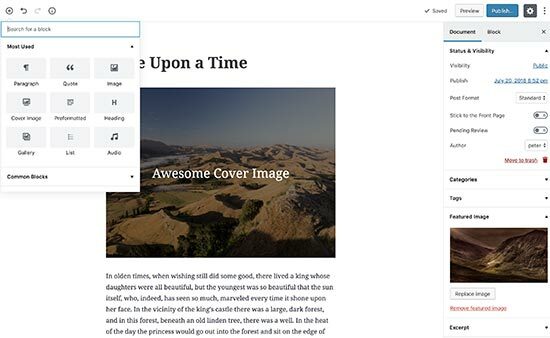 In 2018, WordPress 5.0 was released with a brand new editing experience. The new WordPress block editor project was codenamed Gutenberg. See our complete Gutenberg tutorial – WordPress block editor. WordPress is continuously evolving to address the needs of the millions of web publishers around the world. The direction of WordPress directly depends on the needs of users. We can safely assume that it will continue to empower people around the world to create wonderful web spaces. 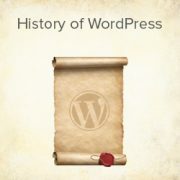 We hope this article helped you understand the history of WordPress. You may also want to see how WordPress works behind the scenes (infographic) and what are the best WordPress plugins that every website should use. Thank you for producing and sharing this. User since 2008. I met Matt Mullenweg at one of the very first Wordcamps held in Frisco, Texas, an up and coming new Dallas city. The setting was almost lavish, high back, heavily upholstered leather chairs in a semi-circular auditorium that was where the political leaders of Frisco assembled. Matt as a very soft-spoken man who came across unassuming, approachable and…… contagious due to his passion for wordpress and his vision of the future. With plenty of other attendees and a room full waiting, he took the time to paint a picture of wordpress and what it would mean to me to take my over 150 sites to a new level through wordpress. I was very impressed then and even more impressed of the growth and development exhibited by this man and a first class team of net specialists. Quite interesting, but would be even more so had it included the number of WP users and/or sites over the years. Great post. As a avid WP user and web designer I’ve often wondered about the history of WP but never seem to have the time to delve into it. This had made me even more determined to set aside some time to read and discover more about WP’s origins, so thank you. Nice post! I didn’t know first WordPress years, thanks for sharing! Beautiful post! I recently found out that all of WordPress’ version history is available to download and toy around with. I wanted to go back, install a few versions, and see how the software has evolved over the years. This just saved me a bunch of time!